We’ve barely recovered from the very epic Game of Thrones season eight premiere that aired on Sunday night, but we’re finally ready to talk about it. Well, we’re really just focused on talking about Arya and Gendry’s reunion on GoT and the weapon she asks him to make for her. Yes, there was definitely some big romantic tension going on between the old friends, but we’re also really curious about the weapon that Arya commissions Gendry to make for her from dragonglass. What is it, exactly? Could it be helpful to Arya in the coming wars against White Walkers and humans? Spoilers ahead for Game of Thrones season eight, episode one. 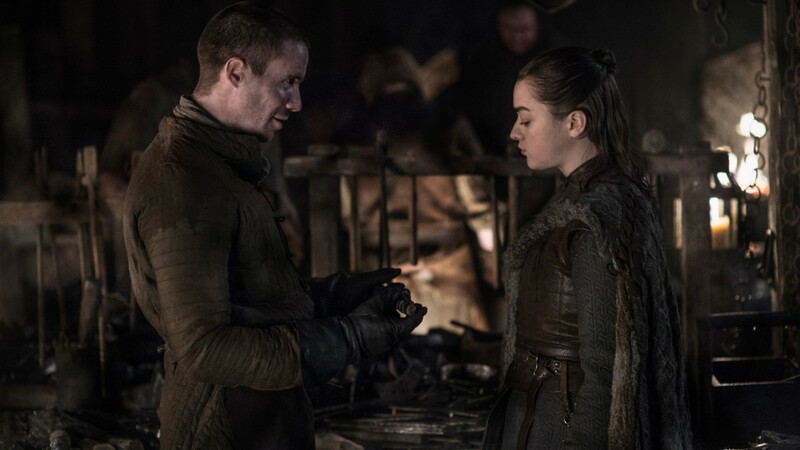 In one of two sentimental reunions during the GoT season eight premiere (the other being her reunion with Jon Snow), Arya met up with Gendry in the forge at Winterfell after spending years apart. The last time they saw each other, it was season three and Arya watched as the Brotherhood Without Banners sold Gendry to Melisandre. Since then, he’s been rowing and she’s been training to be an assassin; so much has changed. The pair had some light banter in their reunion scene, with both quickly catching up while Gendry tried to flirt with Arya by calling her “my lady.” Then, in what will surely become central to Arya’s arc over the court of season eight, there was a moment where Arya asked Gendry to make a special weapon for her. As seen in the clip below, Arya hands over a simple drawing to Gendry, showing him a rendering for a weapon with a dragonglass tip (presumably to be used when she battles the White Walkers) and what could be a different kind of spear tip on the other side. Since Valyrian steel is another weapon that can be used again White Walkers, it’s entirely possible Arya wants to keep all of her bases covered with this new weapon. The weapon also looks like it pulls apart to become two weapons, meaning Arya will likely wield a huge staff (similar to the kind she trained with in Braavos) at some point and then separate it into two smaller hand weapons to make her even more formidable an opponent. Arya seems more ready than ever before to go into battle alongside the rest of her family to defend them and their ancestral home. Sunday night’s reunion scene with Gendry spoke to that fact, as did the drawing of the epic new weapon she will soon be wielding in the coming episodes.